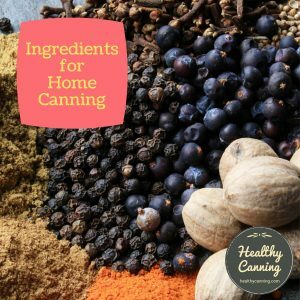 HealthyCanning.com works with liquid stevia as its default sweetener in home canning recipes that require a sweetener. For those wishing to make the original full-sugar versions of the recipes on the site, every recipe provides that alternative as well. 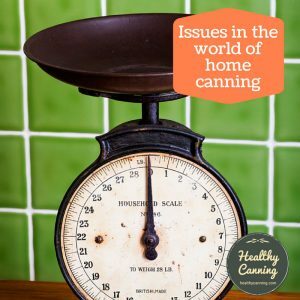 Why have a sweetener at all in home canning? 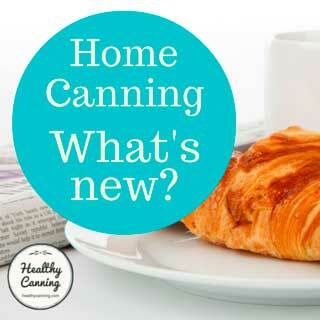 Why stevia for home canning? Why stevia in liquid form? What is the best brand of liquid stevia to get? 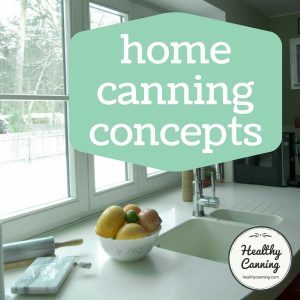 Why didn’t you use honey as a sweetener in home canning? 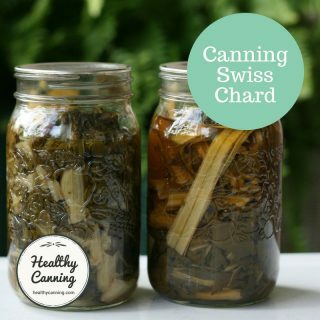 What was the guideline used for replacing sugar with stevia in the canning recipes? Is this stevia / sugar swapping endorsed by reputable canning sources? Stevia is a natural sweetener from the leaves of a plant called “stevia.” Just as sugar is extracted from sugar beets or sugar cane, the sweetener stevia is extracted from the stevia leaves. For in-depth information, you may wish to see the CooksInfo.com entry on stevia. Raw stevia leaves have a bitter after taste to them, unless they are processed in a way to filter those bitter compounds out. Stevia is sold in three forms: powdered leaves, granular with added carbohydrates, and pure concentrated liquid. 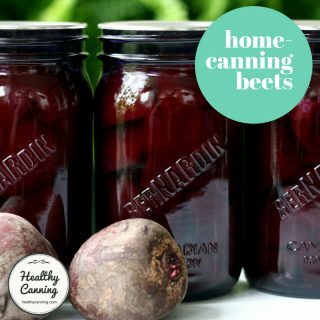 HealthyCanning.com uses the liquid form. It many ways, liquid stevia is just like vanilla extract. It’s a highly-concentrated flavouring liquid that you want to use only in very small quantities, such as a teaspoon at a time, because a little goes a long way. And aside from flavour, it impacts a canning recipe in no more a way than adding a bit of vanilla extract would. You are not changing the density, or the pH. 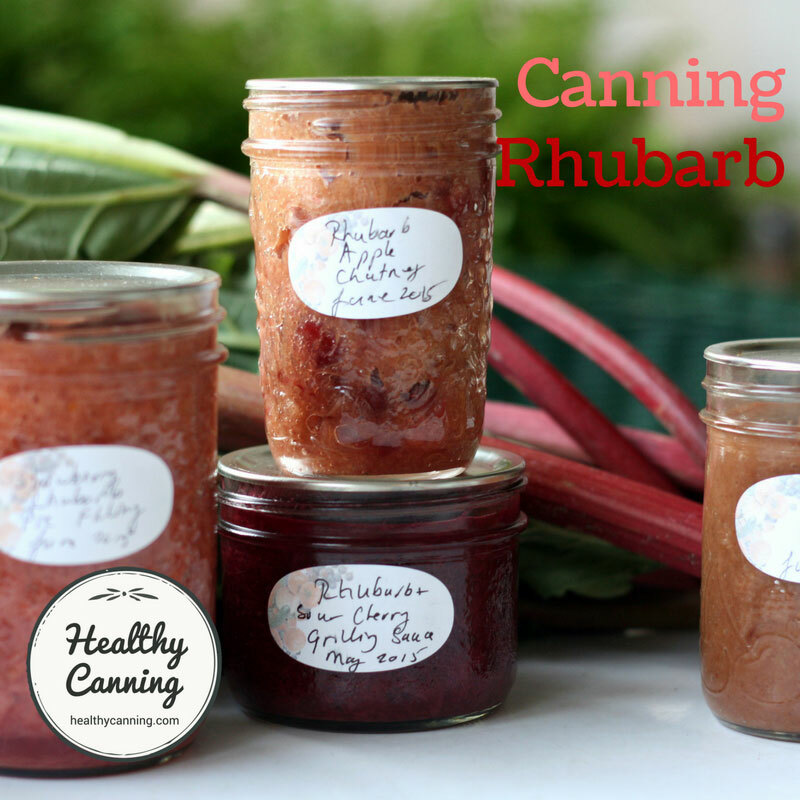 Many home canning procedures of course don’t require a sweetener at all — such as meat and veg. And jars of fruit are more versatile when you go to use them if you can them unsweetened. Some items, though, such as pickles, relishes and chutneys, rely on a very high degree of acidity for food safety. Without some sweetener to help mask and balance some of the acidity, most people would find those products so sour and harsh that they would be unpalatable. Stevia does not change taste or lose sweetness when heated. Stevia-based sweeteners are heat stable and may be used in canning fruit.”  Bastin, Sandra and Debbie Clouthier. 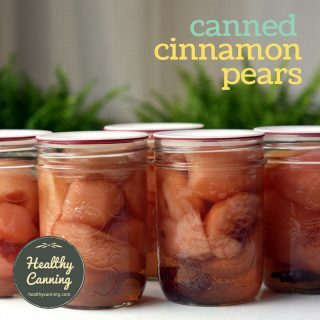 Home Canning Fruit. University of Kentucky Cooperative Extension service. FCS3-584. 2015. Page 2. You tried a form of stevia that didn’t filter out the bitter compounds. 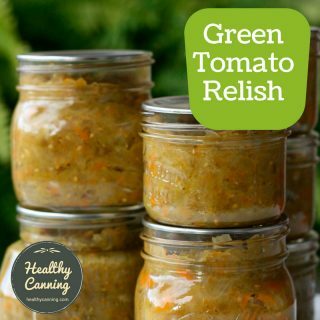 On HealthyCanning.com, we have used liquid stevia as our sweetener in canning recipes. Stevia is pricier than sugar, to be sure. But a bottle of it goes a very, very long way. And, you can compare the price of it to what you would pay otherwise for special store-bought sugar-free or sugar-reduced preserves. You can store your stevia in the fridge for a good, long shelf life. 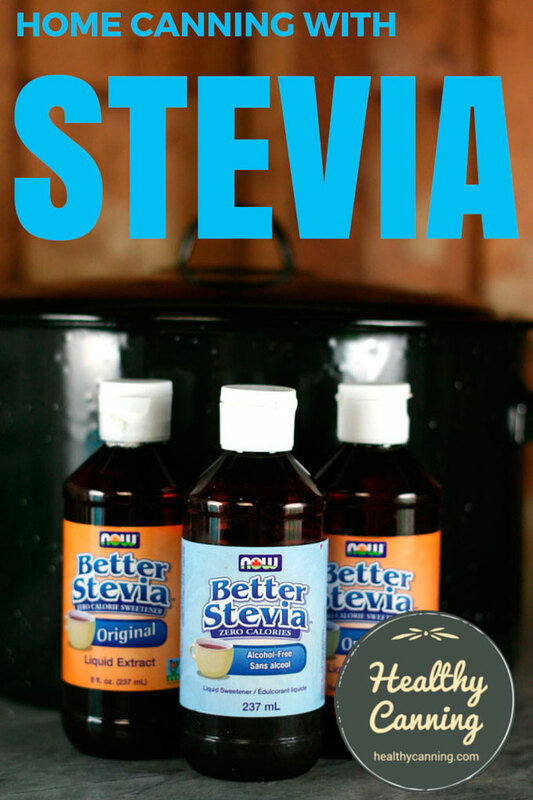 In our view and to our tastes, the makers of Better Stevia have succeeded in removing any and all bitterness. That brand is called “Better Stevia.” In our view and to our tastes, the makers of Better Stevia have succeeded in removing any and all bitterness. It’s gluten-free, organic, GMO-free and certified kosher. While you may still prefer the distinctive taste that real sugar adds to your coffee or tea, along with the sweetness, we’re hoping you will taste no difference in your preserving by using this brand of liquid stevia. Your first instinct will be to taste it out directly out of the bottle and to mull over its taste. That is fine: but, no one in their right mind would eat white refined sugar in that way, just plain spoonfuls directly right out of the sugar bowl. In fact if you do that with white sugar, you might not find you like it that much. But, what’s important about a sweetener is how it tastes as ingredient in something else. To start with, just try to the 2 oz (60 ml) size bottle. Just to make sure you like it. Then, you can upgrade to the larger bottles which work out much cheaper. Make sure you get the original, regular, unflavoured kind. There are two versions of it: one that uses alcohol in the filtration process, and which is a bit thinner, and one which is alcohol free, which is a bit more syrupy. It makes no difference which version you get. Just don’t get the flavoured kinds (French Vanilla, English Taffy, Tropical Fruit, etc.) because they’d impact the flavour of the products you make. Nobody wants to sink their teeth into a French Vanilla Dill Pickle. 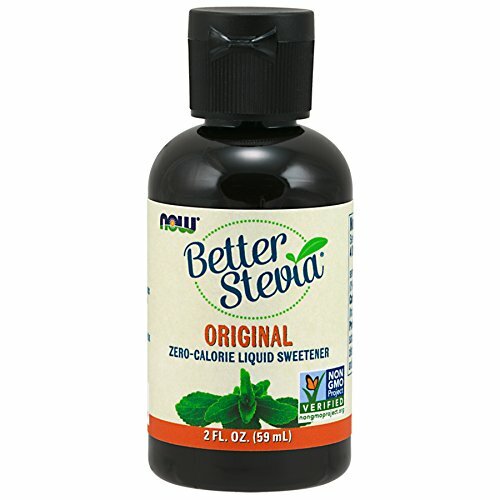 There may be other brands of liquid stevia that are as good as Better Stevia; we’ll try other liquid brands some day. Honey has to be used in relatively large quantities to substitute for sugar. For every 1 cup (225 g / 8 oz weight) of sugar, you can replace with 150 ml (5 oz) of honey. Given that the pH of honey is unreliable and can range from 3.4 to 6.1, that’s a lot of added liquid potentially pushing your product up into the unsafe zone above 4.6 pH. Beyond the safety aspects, from a cook’s point of view, honey would change flavour distinctly, and cloud pickling liquids. Honey is also a form of sugar and adds a great deal of calories to a recipe. That being said, the taste of honey is wonderful, and the site will certainly be including some tested recipes that use honey as a sweetener. 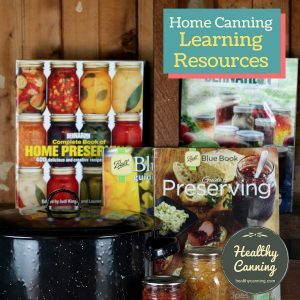 If you would like to see more honey-based recipes for home canning, you may wish to consider contacting some of the reputable sources and asking them to develop more of such recipes. Stevia is incredibly sweet, so as a rule of thumb, when adapting a recipe for sugar-free, we start by using 1 teaspoon (5 ml) of stevia for every 225 g ( 1 cup / 8 oz) of sugar called for in a recipe. Because there are no “dissolving” issues with liquid stevia as there are with sugar, you can add stevia even at the very end of a recipe if a last minute taste leaves you feeling you want a bit more sweetness. We should add one thing: first, a recipe was examined to make sure that it didn’t rely on sugar to provide safety through reduced water activity. There are a very, very small handful of recipes like that. Recipes such as Corn Cob Jelly and Maple Walnut Syrup are both water-bathed (or steam-canned) recipes missing anything acidic in them at all — there isn’t even a bottle of lemon juiced waved in their general vicinity — so they clearly rely on the presence of sugar molecules to provide safety by binding up all the water thus depriving the nasties of any water to do anything. These recipes must be left as is. The research of reputable sources is showing that stevia is fine in home canning. And, academically it’s acknowledged that sugar in the quantities used in home canning rarely plays a safety role (aside from the handful of reduced water activity recipes). That being said, for legal liability reasons they can never and will never endorse any changes, of sweetener or any kind, to the recipes they published. And who can blame them — there’s no upside for them in doing so. 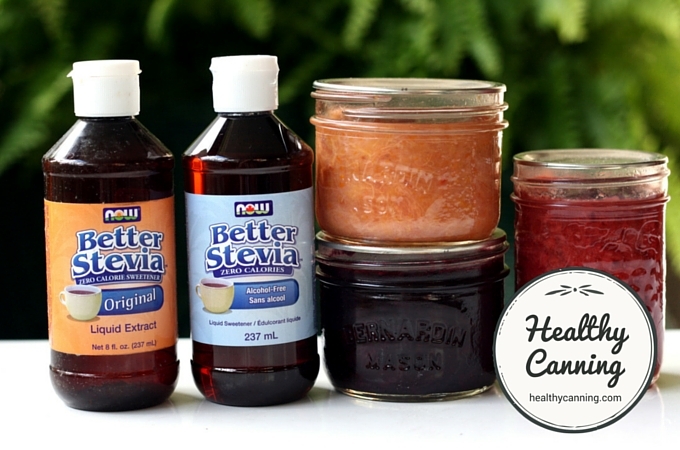 So while HealthyCanning.com has striven in every other aspect of home canning to be plus catholique que le pape, this aspect of swapping sugar for stevia is enough to make the site a heretic site in the eyes of the Safe Canning Police. The sweetness from stevia is in a molecule named “stevioside.” It’s unaffected by heat up to 120 C (248 F.) Most home pressure canning is done at 5 degrees C below that: 115 C (240 F), and water bath canning never gets about 100 C (212 F). 2. ↑ Bastin, Sandra and Debbie Clouthier. Home Canning Fruit. University of Kentucky Cooperative Extension service. FCS3-584. 2015. Page 2. So if liquid stevia needs to be stored in the refrigerator to protect its shelf life, how then, are canned products “shelf stable”? I have used liquid stevia and know that it can loose its sweetness if left at room temp, but this does not happen in the jar? When sealed hermetically in a jar, it is protected from air. How to convert measurements for Stevia liquid in canning ??? The ratio I go by is 1 cup / 250 g white sugar = 1 teaspoon liqud stevia. In some recipes, you may want to, out of personal taste, add an extra teaspoon for the pot. 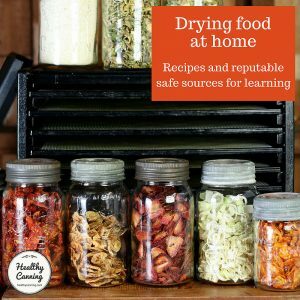 What canning recipes were you thinking of using it for? Could I use Stevia in the Raw? It is in powder form in green packets. Hi Linda, you can try it. You would need to work out the equivalency ratios for sweetening. We’re aware of that form of stevia, and actually have some. The only reason we went with the liquid is that we we sure in the quantities used, it would be pH and density neutral. And, the liquid has the bitterness filtered out. Thank you so much. I have been looking for a sight like this and just happened upon it as Blackberries are ripening and thought Pie filling. Loved the Stevia information as I have diabetics in my family and also like to keep my own calories down. Since sugar adds preservative qualities to canning – how much shorter is the shelf life when using stevia instead? I have relishes, jams, chutneys, pickles over two years old using liquid stevia as the sweetener, and the quality is still amazing — almost certainly because I followed tested recipes and tested USDA canning procedures for those recipes. Of course, anecdotal evidence from one person is not equivalent to full, rigorous lab testing, I have to acknowledge that intellectually. But *that* being said, the USDA likely wouldn’t test to see just how many years sugar-free stuff is good for on the shelf, if only because they won’t certify shelf life for *any* canned goods over 1 year. Their stance is, use within one year for best quality. 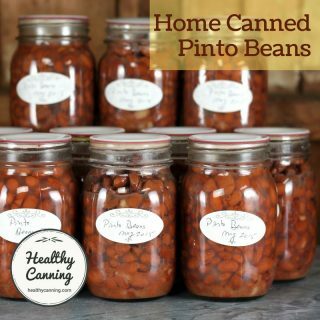 https://www.healthycanning.com/the-shelf-life-of-home-canned-goods/ . And I don’t blame them. Otherwise, they’d get people complaining that stuff wasn’t any good 20 years later. 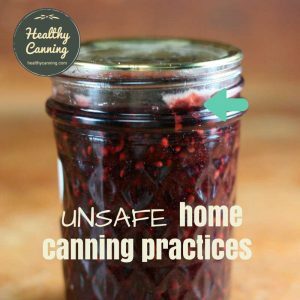 If you have followed recommended, tested canning procedures from the USDA or other trusted sources such as Ball or Bernardin, you will for sure get your 1 year storage life out of your home canned sugar free goods. I’d like to emphasize that if you are canning sugar-free, it’s triply important that you follow modern, tested canning procedures. Those procedures sterilize the inside contents of your sealed jar. I have unopened sugar-laden jars of jams from friends who did not follow USDA procedures for processing their jars of jams, and the unopened jars are full of blue and green mould. Sugar did not save the contents. Only proper processing methods will. Where the preservative qualities of sugar come into play is after opening the product. Then, the water-reduction ability of sugar plays a role when the jar has lost its protective seal and is exposed again to the elements. In something with a very high acid content such as ketchup, relishes, pickles, that doesn’t matter — the acid seems to act as somewhat of a preservative after opening (though it can depend on what moulds happen to be floating in the air on a given day, many moulds don’t mind acidity.) It does seem to matter in jams though. Commercial sugar-free jams opened, then stored covered in the fridge, have been good for at least 6 months in my experience. After a year, though, I’ve had a few opened jars in the fridge develop a mould in them. That’s commercial, such as the Weight Watcher brands, and home-canned jams made with Ball or Bernardin pectin, all of which have additional preserving agents added. Again, though, you can get longer after-opening storage life with the Ball or Bernardin no-sugar needed pectins, as they have those extra preservatives added. I would expect with other big name sugar-free brands too such as Certo, etc. I am diabetic and want to make a tomato, pepper, onion relish like Harry and David makes, except I want to use Stevia to sweeten it. I would like to freeze it is small containers, like in ½ cup plastic instead of canning. I’ve been concerned about the shelf life after I would take one of them out of the freezer and put it in the fridge. I am deducting from what you said above, that because this recipe calls for vinegar, the relish would be acid and have a shelf life of at least a month?, most likely, not holding you to this. Is that about the ballpark for a shelf life?. Thank you for posting. I would think that, after thawing, expecting 3 to 4 weeks life span in the fridge is not unreasonable. I think what helps is not leaving the jars sitting out on the counter for hours with the lid off, inviting moulds to come and see what they can do (as I’ve been prone to do when I’m busy and scatter-brained :} ) We’re so used to doing that with commercial stuff, which has masses of preservatives added, that old habits are hard to break sometimes. But yes, just watch for mould and after a few jars you’ll have seen if it can go longer. Don’t scrape moulds off, discard the contents.